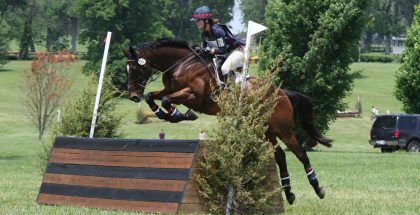 Jenna and Her Two Boys: An OTTB Story by Casey Laughter– Think of having a horse for only eight months before tragedy strikes. That is what happened to Jenna Encheff. 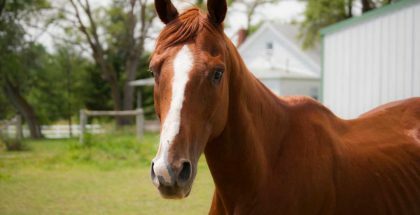 Her beloved Quarter Horse/Saddlebred cross suffered a fatal bout with colic. However, Jenna knew she had to honor one life with saving another. That is when A Little Elusive came into her life. 2009 was the year Jenna embarked on the journey with the New Vocations graduate. As a racehorse, A Little Elusive was bred to be fast, but that does not equate to how he was competitively. A Little Elusive only placed first, second, or third six times in twenty starts. 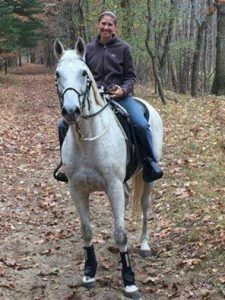 Jenna was amazed at the quality of horses New Vocations accepted and rehomed that, when a horse she had had for 27 years, a thirty-year-old quarter horse, passed away, another horse was just the way to continue down the road of horse ownership. Going back to New Vocations, Jenna knew an older horse was just the way to go. While A Little Elusive, now named Jazz, was her go-to trail horse, an older horse was there for companionship, both for Jazz and Jenna. Just two months into her search, Jenna was contacted by a woman named Amy, a trainer at New Vocations. Amy had sent photos of a thirteen-year-old gelding named Rat Like Cunning. Rat Like Cunning caught the attention of the media, as he was produced in the first crop of the near Triple Crown winner, Silver Charm. 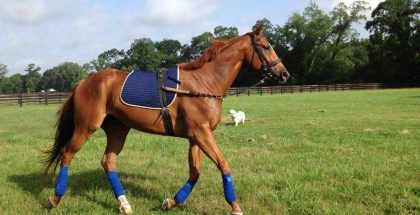 Rat Like Cunning was in racing condition when arriving at New Vocations in Marysville, Ohio. The gelded son of Silver Charm was almost a spitting image of his sire, about 16.2 hands, lean, and nearly white with age. Jenna was sold. After a few weeks of travel, Jenna returned home to welcome her second OTTB home. With some introduction, Rat Like Cunning, more lovingly known as Mishka, was turned out with his little brother, Jazz. The brothers relax in their paddock together most of the day, spending all the time they want outside, or inside, as they have 24/7 access to the barn. One thing about racehorses is that they are “socially awkward,” unsure of how herd behavior works at times. At age thirteen, Mishka had some catching up to do. One thing about racehorses is that they are “socially awkward,” unsure of how herd behavior works at times. At age thirteen, Mishka had some catching up to do. While Jazz was the younger of the two, he definitely assumed the “big brother” role, putting Mishka in his place if needed. Mishka was seemingly making up for lost time, being extremely playful and pushing all the buttons that Jazz had. Due to this button pushing, Mishka was covered in nips and scrapes for about the first six to eight months he was in his new home. OTTB’s have some special qualities about them, however. 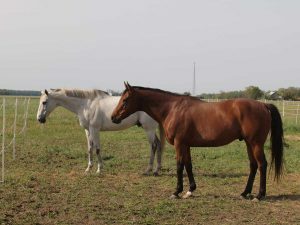 When adopting an OTTB, you are almost guaranteed a horse who can stand for the farrier, be clipped, trailered, has already been exposed to different scenarios and conditions. This seemed to be a positive, and a negative, with Mishka. While the snow white gelding detested grooming, he was up for the challenge when Jazz suffered an injury to his stifle and had to pass riding duties to him. Jenna, was, to say the least, nervous about riding Mishka. While the snow white gelding detested grooming, he was up for the challenge when Jazz suffered an injury to his stifle and had to pass riding duties to him. Jenna, was, to say the least, nervous about riding Mishka. With two wonderful horses and two wonderful stories, Jenna does her best to divide her riding time so neither feels left out. It has been two years since Mishka arrived home to Jenna. She adds that both boys love their jolly balls and playing soccer with their mom. Jenna is such a horsewoman that she rarely blankets her horses, leaves them barefoot, and even trims their hooves! Three-Year-Old Male Eclipse Award: What Now?